Lifting the Bronze Age sword (© GUARD Archaeology Ltd). Archaeologists in Scotland have unearthed a hoard of stunning prehistoric artifacts, including a bronze sword and rare gold-decorated spearhead. The trove was found prior to the construction of two soccer fields in Carnoustie by experts from GUARD Archaeology, working on behalf of the local government. A spokesman for GUARD Archaeology told Fox News that excavations at the site have just finished. The artifacts, which date to around 1,000 B.C. to 800 BC, have delighted archaeologists. “It is very unusual to recover such artefacts in a modern archaeological excavation, which can reveal so much about the context of its burial,”said GUARD Archaeology Project Officer Alan Hunter, who directed the excavation, in a statement. The excavation site contains a host of archaeological features, including 12 circular houses that probably date the Bronze Age, as well as two halls likely dating to the Neolithic period, one of which is the largest of its type ever found in Scotland, estimated to be 6,000 years old. Clusters of large pits were also discovered, one of which contained the haul of metalwork. The Carnoustie Bronze Age spearhead (© GUARD Archaeology Ltd). In addition to the bronze spearhead and sword, archaeologists also found a lead and tin pommel from the end of a sword’s hilt, a bronze scabbard mount and chape (the metal point of a scabbard), and a bronze pin. Archaeologists say that the spearhead’s gold ornament is particularly noteworthy, with the precious metal likely used to enhance the weapon’s visual impact. 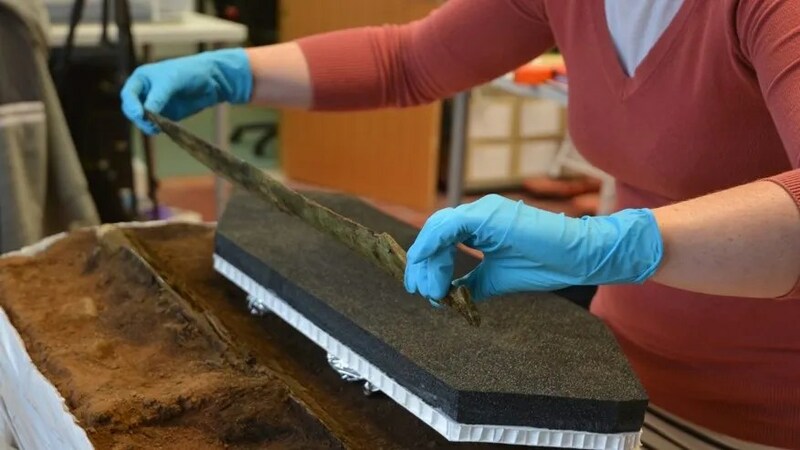 The Carnoustie excavation also unearthed rare organic remains, such as a wooden scabbard that encased the sword blade, fur skin around the spearhead and textile around the pin and scabbard. 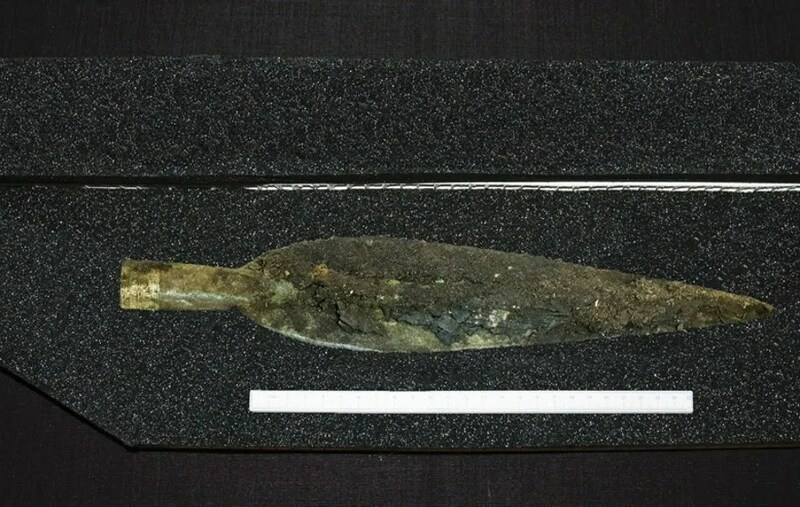 The Carnoustie Bronze Age sword (© GUARD Archaeology Ltd). 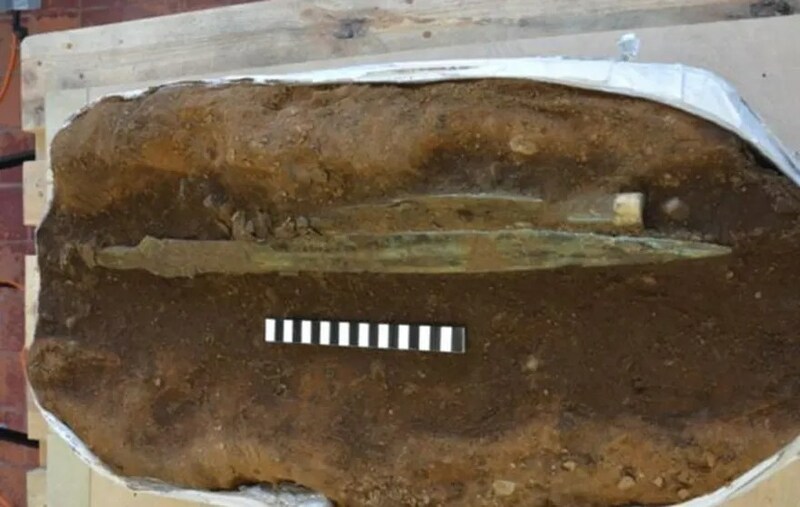 ‘Organic evidence like Bronze Age wooden scabbards rarely survive on dryland sites so this just underlines how extraordinary these finds are,’ said GUARD Project Officer, Beth Spence, in the statement. Because the remains discovered at Carnoustie are so fragile, archaeologists removed the entire pit and its surrounding subsoil and transported it to GUARD Archaeology’s lab, where it was CT scanned and X-rayed by the School of Veterinary Medicine at Glasgow University. Scan and X-ray data helped experts remove the artifacts from the block of soil. The bronze sword, pin, and scabbard fittings were unearthed near the spearhead. This is just the latest fascinating archaeological discovery in Scotland. Experts, for example, have spent the last few years piecing together the history of a long-lost early medieval kingdom in southern Scotland.